The Doberman should be elegant in appearance, with proud carriage, reflecting great nobility, and should be compactly built, muscular and powerful for great endurance and speed. Acceptable heights: Males 26 to 28 inches; Females 24 to 26 inches. Smooth haired, short, hard, thick and close lying. Invisible grey undercoat on neck permissible. Allowed colours: black, red, blue and fawn. Dobies are natural guardians and protectors. They are highly intelligent and trainable. Early socialization is important and they thrive with close human companionship. 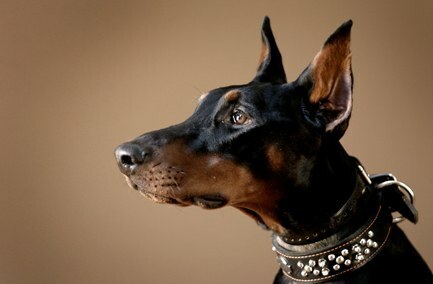 Their most important medical concern is Dilated Cardiomyopathy which has been recorded in as many as 50% of Dobermans.